We are now the proud owners of a PSP. After upgrading to the 2.0 firmware the first order of business was to connect the wifi. After several false starts, and after upgrading the firmware on the Linksys Wireless Access Point, I finally succeeded. 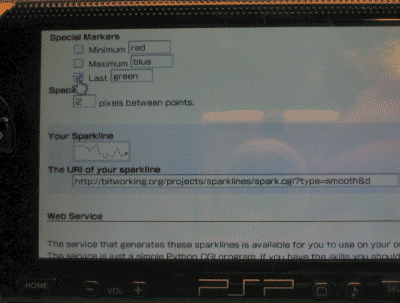 I was pleasantly suprised to find that the PSP web browser worked out of the box with my Sparklines Generator.